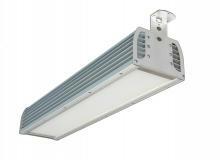 The LED luminaires of the EPHT type are designed to illuminate the indoor area of tunnels as well as road intersections and "Conflict" zones under bridges and fly-over bridges. Using a special optical system the necessary characteristics for illuminating the respective site are realized. The luminaires are very effective in illuminating production areas in industrial sites, where high level of hermetization is required. Depending on the particular site appropriate installation parts are foreseen. Way of ordering EPHT series - HERE.